Hammer Contractors remodeled one of three projects in this lovely home located in Potomac, Md 20854. One of them being this restroom located in the hallway portion of the home used as a guest bathroom. Although a more closely-knit space, this guest restroomâ€™s remodel was not at all contrary to the saying â€œbig things come in smaller packages.â€ Thus, there were some focuses involved in getting this compact restroom to the beautiful remodel it is now. The goals of this project were to provide more extra storage space in restroom that guests could likely use while visiting, to enhance the overall design of the restroom to a more â€œup to dateâ€ look , and provide a design that would still complement and suit the current style of the home. 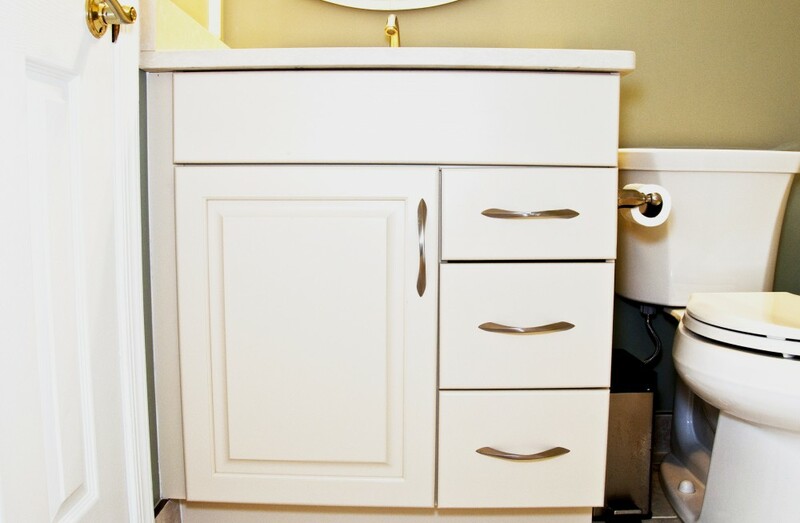 To resolve the storage needs, a new more spacious vanity was added to bathroom. The bathroom remodel was given a more up to date look by trading the outdated brighter blue walls for beautiful butter cream colored walls with neutral green accent on tiles to complement slightly lighter tone on main walls. The overall design and bathroom resulted in a remodel that meshed well with the overall tenor of the home. Most importantly, this beautiful guest bathroom remodel is now a space the homeownersâ€™ love, and the design team enjoyed creating.